Tatevik Ashuryan received a Master’s Degree from Komitas State Conservatory of Yerevan after studies with professor Anna Saragyan and became the principal soloist of the Armenian National Academic Theatre of Opera and Ballet. She has appeared on stages of Great Britain, Iran, Canada and her native Armenia. She holds numerous awards and prizes. Amongst these is the 2nd prize in the International T. Sazandarian/P. Lisitsian Competition (2011) as well as the Spendiaryan Special Prize of the Armenian National Academic Theatre of Opera and Ballet. Tatevik is a laureate of the International Maria Bieşu Competition of Opera Singers (Moldova). 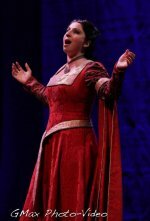 The young singer was invited by the Opera Belcanto of York to perform in Toronto, where she gave her Canadian debut opera performance, performing the role of Leonora in Verdi’s Il trovatore.